Rotary dimming and switching of DALI Broadcast installations. Fits into standard plate and grid systems. 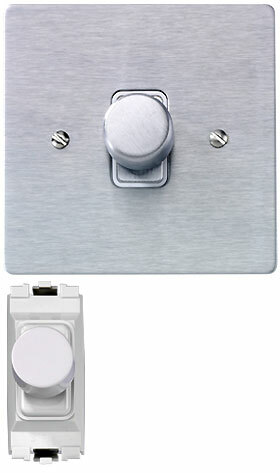 Fits standard plate and grid systems including Wandsworth, MK, Focus sb, Hamilton, Scolmore. For manufacturers not listed, including Forbes & Lomax, please call Multiload. All modules available to match any style or finish. 24V power supply for MDR100. Supplied with each unit ordered. MDR100 and MDR100-MKGP are supplied with a dedicated 24V power supply. MDRPSU. Ambient temperature: -10°C – +50°C. Less than 95% rh non-condensing. Low voltage digital output signals. 24V to be connected to the positive output of a 24V DC power supply and 0V to be connected to the negative output of the 24V power supply. 24V DC supply for MDR100.